So, if you haven’t noticed on That Girl’s Instagram, I am just a little obsessed with handstands. For me, turning my world upside down focuses my mind and brings me back to the present moment. In a world where we are becoming obsessed with going further and pushing harder, we often lose the rich quality of being present in movement. The need to “get there” can blind us from the present moment, the moment we connect our mind and body, the movement we silence our internal mind, that moment we find alignment and balance. 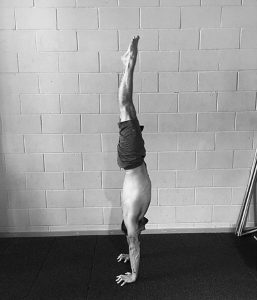 In order to achieve a handstand correctly, we need to regress and learn progressive steps in order to acquire the skills to perform the movement faultlessly! To perform a handstand we first need to create a stable base from which we can stack each layer of our body upon. This requires a humble approach, time, and a lot of patience. 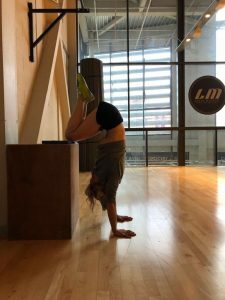 Flinging yourself into a handstand with no body awareness, presence, or aptitude, will likely result in a somewhat banana shaped posture – have you ever seen a gymnast throw themselves up into handstand with flapping legs!? Instead, we need to take it step by step, regressing to a place where we are able and comfortable to work. Through each progression we add a layer of learning from our experiences. For me, in each progression I spend a lot of time with my coach, @elliot_themovement, working in modified positions where he continuously cued me until I learnt what I needed to do to create the base and stack my body. These cues became my self-talk when practicing on my own. It’s finding what works for you, so that a handstand feels as natural as standing on your own two feet! These images show you two progression stages for stacking the body. Notice how I stack my shoulders over my wrists and hips, in line with my shoulders. Notice, I’m trying to straighten my legs fully and point my toes. For me in this posture, my base is now stable and I’m finding it easier to connect with abdominals and float up. In the beginning, one needs to spend consistent time developing a sufficient range of motion and strength in the shoulders and core strength. The process of achieving a handstand is very humbling; it is a long road of dedicated, consistent actions. If you want instant gratification, then it will be at the price of never truly mastering the handstand.